Tapjoy is proud to announce today the launch of the Interplay™ Studio, an in-house creative team and design studio dedicated to helping brands, agencies and performance marketers deliver best-in-class mobile ad creative optimized for in-app environments. Comprised of a team of award-winning designers, video producers and product specialists, the Interplay Studio offers white-glove service to help advertisers meet their campaign objectives, providing end-to-end support ranging from ideation and creative development, to live operations and optimization for long-term performance. The Interplay Studio leverages Tapjoy’s expertise in mobile gaming and value exchange advertising to develop custom-branded and contextually relevant Rich Media ads, Playables and Interactive End Cards for mobile video ads. Interplay Ads run in unique in-app environments, such as natural breaks in the gameplay or in exchange for premium content or in-game goods, ensuring high levels of engagement and brand safety. 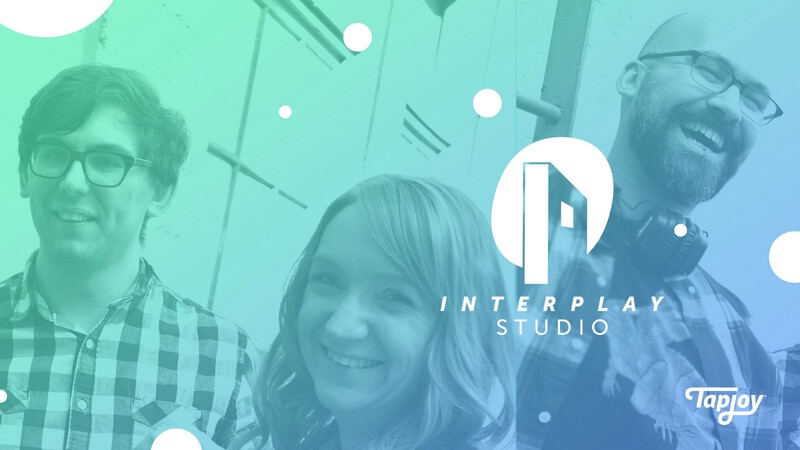 The Interplay Studio taps into mobile gamers’ mindset to develop fun, engaging ads that serve as a seamless extension of the gaming experience, while powerful machine learning algorithms go beyond standard engagement metrics, such as impressions and clicks, to optimize for downstream metrics, such as sales and conversions. Campaigns designed by the Interplay Studio have demonstrated average click-through rates that are 3–5X greater than traditional mobile video ads and deliver average in-ad engagement times of nearly 30 seconds. 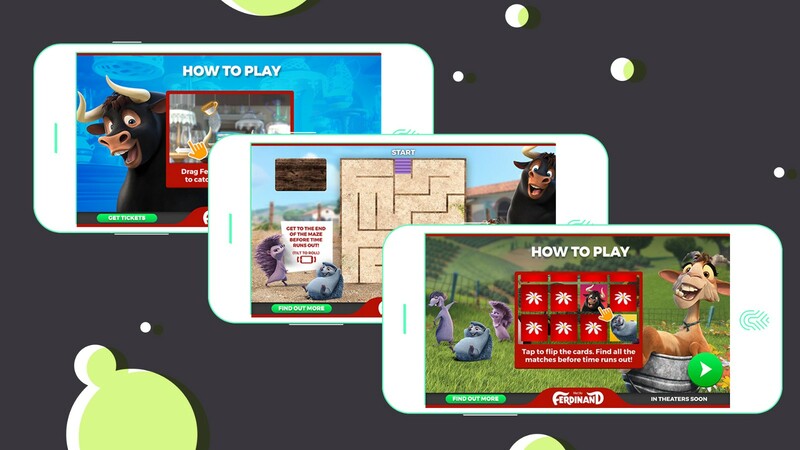 Vizeum, the central media agency for 20th Century Fox International, approached Tapjoy to develop an in-app mobile campaign aimed at driving audience engagement and ticket sales among movie-going parents with young kids. 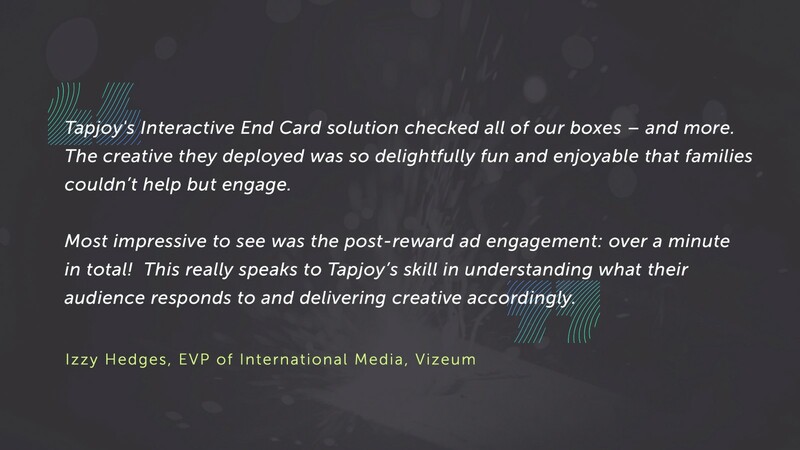 To meet these objectives, the Interplay Studio designed three custom versions of Tapjoy’s Interactive End Card and Playable Rich Media ad units to appear at the end of the movie’s video trailer. The ad units featured interactive mini-games such as a “Mix & Match” memory card game, a “Bull in a China Shop” fall-and-catch game, and an “Escape” maze game. In total, the team produced 220 creatives for the campaign, localized for 16 different countries. The average video completion rate for all three campaigns was an astonishing 97 percent, while the average time spent with the Interactive End Cards and Playable Rich Media ads units was an additional 30 seconds after the user viewed the 30 second trailer, equaling about a minute of total in-ad engagement time. This level of engagement demonstrates the impact of the creative, as users chose to continue engaging with the ad, even after they were rewarded for their time.